In recent decades there have been several constructivist scholars who have looked at how norms change in international relations. However few have taken a closer look at the particular strategies that are employed to further change, or looked at the common factors that have been in play in these processes. This book seeks to further the debates by looking at both agency and structure in tandem. It focuses on the practices of linked ecologies (formal or informal alliances), undertaken by individuals who are the constitutive parts of norm change processes and who have moved between international organizations, academic institutions, think tanks, NGOs and member states. The book sheds new light on how norm change comes about, focusing on the practices of individual actors as well as collective ones. 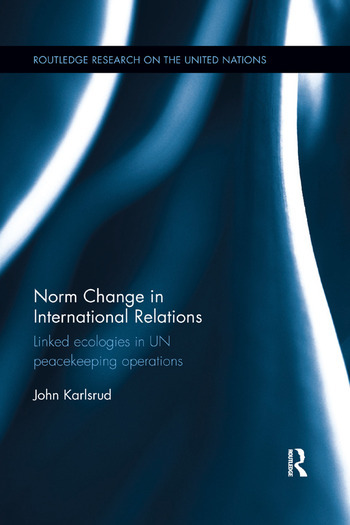 The book draws attention to the role of practices in UN peacekeeping missions and how these may create a bottom–up influence on norm change in UN peacekeeping, and the complex interplay between government and UN officials, applied and academic researchers, and civil society activists forming linked ecologies in processes of norm change. With this contribution, the study further expands the understanding of which actors have agency and what sources of authority they draw on in norm change processes in international organizations. A significant contribution to the study of international organizations and UN peacekeeping, as well as to the broader questions of global norms in IR, this work will be of interest to students and scholars of international relations alike. John Karlsrud is a Senior Research Fellow at the Norwegian Institute of International Affairs (NUPI).